Most people think of a swan as a large aquatic bird, but to me a swan is a poorly child, a child whose condition is undiagnosed. An undiagnosed child is a child who has a genetic condition that no doctor knows what it is. It could be due to the rarity of the disability meaning no doctor has ever come across the combined symptoms before or it could be due to having so many symptoms they can not match it to an already diagnosed genetic condition. There are approximately 6,000 children born in the UK alone each year with a syndrome without a name, or as this community likes to call it – a swan. 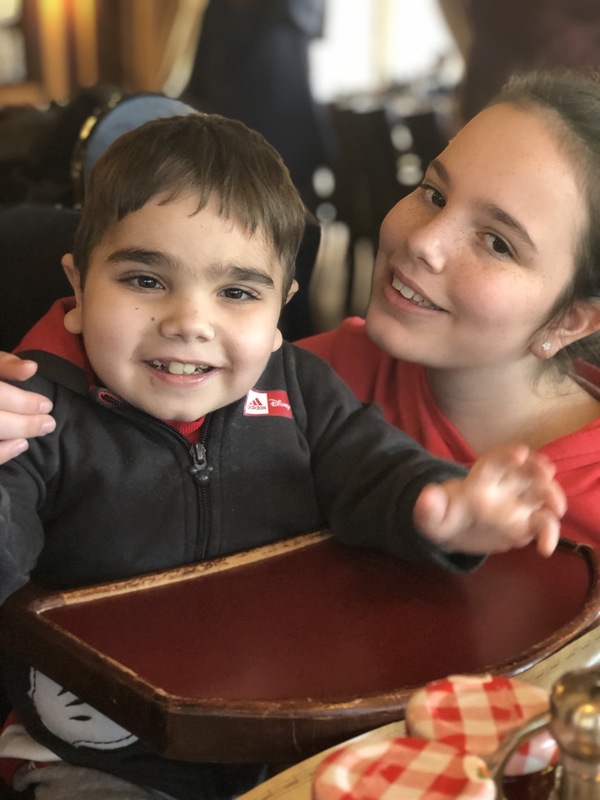 My brother Dylan is eight years old, he is suffering from an undiagnosed, life-limiting condition and is stuck in the mind and body of an 18 month old. He has lots of things wrong with him such as his organs are the other way round to yours and mine, he stops breathing, he has arthritis, he doesn’t grow (he’s a real life Peter Pan), along with many other illnesses. No doctor in the UK can get to the bottom of his condition and nobody knows if they ever will find out what is actually wrong with him. If you walked past him in the street you wouldn’t know just by looking at him what he goes through on a daily basis. As far as we know he is the only person in the world with this. He is under over 40 doctors and therapist and under 17 different teams at Great Ormond Street Children’s Hospital where he is constantly in and out, like a train going from station to station. He has to have many different medicines and injections daily, including chemotherapy, steroids and morphine, plus lots more. These help to reduce different pains and make his life more comfortable. Although, despite everything different about him, he is still the loveliest, sweetest and cheekiest boy you will ever meet. Doctors are always working on coming to a conclusion to an undiagnosed child’s condition through lots of genetic studies and tests, but the majority of the time they unfortunately fail. Some believe that if they do not know, why should they be wasting their time and resources on something they may never identify? Why should they be spending the vast amounts of hours on rare conditions when they could be spending it on finding a cure for other illnesses? Well I will tell you why they use their time and resources on undiagnosed children – because we want these children to grow up into adulthood happily and healthily, because without this research nothing in their lives will change, they will be trapped in the valley of despair forever. It is also doctors’ jobs to care for these children as they would for patients who live with a diagnosis. They need to help the children and their families through these tough times. Being undiagnosed can be a lonely place for the whole family and without a diagnosis these families constantly fight for the right help and benefits they need and deserve. They are constantly living with torture, agony and suffering so doctors should be trying to conclude their discoveries and help these innocent children. They never asked to be undiagnosed so nobody should have the right to say otherwise. They live daily with the unknown always crashing against them, burning their eardrums with untold words. Your negativity will not help them. Another thing to add to this topic is that undiagnosed children get restricted from so many opportunities. They may not be able to get certain job roles, they may struggle to make friends and so much more that you and I take for granted. We need to start looking from other people’s perspective and actually think how would we feel if we were in this situation? How would we feel if it was our worlds coming crashing down? How would we feel if it was our cries that were being ignored because of our differences. Indirectly I live this first hand. Every one of us is different. Not everyone in this room has the same hair or eye colour, is the same height or weight. Would you want to live in a world where everyone was the same? No, that’s what I thought, this is why we are all unique. In conclusion, we need to share this message as it is important to spread awareness on this topic. I strongly believe it needs to be heard, especially since it is Undiagnosed Children’s Day on 26 April, which is a national fundraising and awareness day to help raise money for more research, tests and support. You can donate online if you are interested in helping out by visiting undiagnosed.org.uk. Think of the hope you could give a child. Think of the smile you could paint on a child’s face. SWAN UK is the only support network in the UK for families of children and young adults with undiagnosed genetic conditions. Want to know more? Get in touch: info@undiagnosed.org.uk.